Facade installation continues on the exterior of the City Centre project on the 300 block of East State Street. According to project representatives, all three commercial retail spaces on the ground level have been reserved. Along with the Ale House, the other spaces will be “a financial institution and a new dining experience from a beloved local restaurateur”. The rumor mill has suggested a couple of names for that restaurateur, and that the initial concept was to be Italian, but with the opening of Pasta Vitto across the street, the tenant is taking the restaurant in a new direction. For those interested (and not necessarily looking for a new apartment), City Centre has finished out a few model units for hard hat tours. You can stop by the leasing office on the Commons to schedule a walkthrough. Some of the project team members have started to tout their involvement with the project, which is generally a good sign (it means they’re proud of their work). The image above comes from Whitham Planning and Design, of which I’m kinda jealous. Meanwhile, the regional Carrier equipment dealer is touting the project’s use of a Toshiba-Carrier VRF HVAC system – Variable Refrigerant Flow, the technical name for the electric heat pumps the building utilizes. The heat pump system and its units are being installed by Petcosky and Sons, a heating and plumbing subcontractor out of Vestal. Purcell Construction is the general contractor (and their City Centre webcam is here). The project is still on target for a June 2019 opening. The project background and description can be found here. Just noting that the structural steel frame is fully built out up to the fifth floor and that fireproofing and sprinkler system installation is underway. The project utilizes SidePlate Systems for lateral steel connections, which utilizes a lighter frame design that is still durable. This has a higher upfront cost in design, but may balance out much of that with reduced materials and labor costs, as well as being able to stick to a tight buildout schedule. The IBEW (International Brotherhood of Electrical Workers) Local 241 is proudly touting their involvement with the buildout, and local labor advocates will be pleased by the commitment to local union labor. Taylor the Builders is the general contractor. Retail and office spaces are available for lease through Pyramid Brokerage’s David Huckle. The first floor Commons-facing units are being offered at $24/square foot (3-5 year lease), and the second and third floor office space is being offered for $22.50-$24/square foot. The retail spaces are 2,674 SF, 2,900 SF and 9,210 SF, which can be combined by a deep-pocketed lessee for a maximum of 16,241 SF. The minimum leaseble office space is 2,900 SF (which Pyramid describes as being about enough for seven people in a Class A environment), and the maximum is 33,832 SF (enough for 135 workers). The online as says a 2022 completion, which is overly, overly conservative. I would take a guess at Q4 2019 or Q1 2020. Obviously not the Spring 2019 they originally hoped for, but there have been numerous weather issues that delayed the concrete pours for weeks. The rest of the steel frame should rise faster since the tower portion (floors 6-12) is only a fraction of the building’s overall footprint. For practical purposes, I’m calling this one complete as of the end of this year. At least one of the new stores was set up and ready for opening (Gee June Bridal) while a couple others were just starting to fit out their spaces with equipment for their own launches. Among them will be Halal Meat and Groceries, One Ring Donuts, Hair • Color • Art and Bramble, an herbal retailer, moving from its Press Bay Alley slot. Calzone restaurant D.P. Dough will move from the rear storefront to the front of the 108-114 West Green retail strip, right along West Green Street in the former Hausner’s Garage. The hawk mural was given a touch up courtesy of Connecticut-based street artist Ryan ‘ARCY’ Christenson. $1200-$1300/month is more than the 75% AMI below-market units they were originally aiming for, but not by much – $1200/month works out to $48k-$52k/year, or 80-90% of the local AMI of $59k. “Workforce housing”, to borrow a Visum Development Group term for the 80-90% bracket. The biggest deviation from the plans appears to be that the passage into the former Ithaca Journal press building has not been built, and instead of vegetation and hardscaping for the amphitheater and court pavers, it’s only vegetation. It’s not clear if the amphitheater and west entry to the press building will be built at a later time. 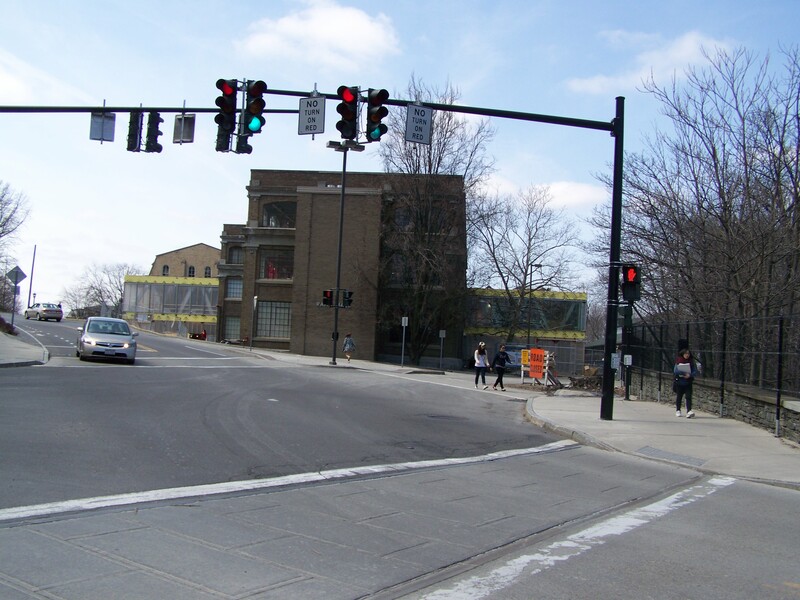 All in all, this is a great project to have in Ithaca’s Downtown. It extends the vitality of the Commons westward in a form sympathetic to the neighborhood and physical surroundings, making use of a vacant building. It also enhances Press Bay Alley by generating more foot traffic next door. It will provide complementary attractions to make downtown a more engaging place for visitors, and supplies a bit of new moderate-income housing. A big win for the city of gorges. More info on the development of the project can be found here. Hard to believe that these two photos were taken in the same room but they were. It has been a long, difficult journey but it has definitely been worth it!